When preventive measures can fight encephalitis, is there a need for treatment in ill-equipped primary health centres? 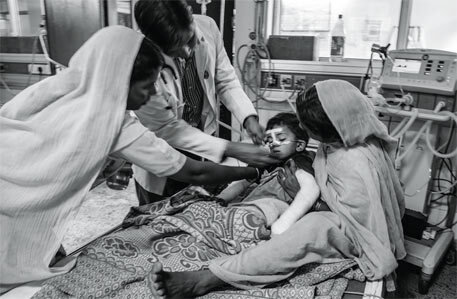 For four years, Holiya village in Kushinagar district, Uttar Pradesh, did not witness a single case of encephalitis, a remarkable achievement for a village which was once extremely vulnerable to the disease. But in September 2013, Abhinav Singh, barely five, succumbed to acute encephalitis syndrome (EAS). He was the first casualty since 2010, when a prevention plan was launched by local volunteers. Omkar Singh, a teacher in a government school, says the village had witnessed at least seven encephalitis-related deaths and five cases of permanent disability resulting from the disease between 2006 and 2009. The situation changed when a physician, R N Singh, took up a project to tackle the disease. He and a few volunteers initiated preventive measures, which included improved sanitation and access to safe drinking water, vaccination, fogging and use of mosquito nets. The project cost an estimated Rs.3 lakh, which was contributed by the local people. Arranging clean water was a major challenge as the village people could not afford modern technology to purify water. Singh suggested a simple and affordable technique: purifying water by exposing the micro-organisms in it to the ultraviolet rays of the sun, thus killing them. The next big challenge was sanitation. Almost the entire village defecated in the open for lack of toilets. The volunteers started a door-to-door campaign to make people aware about the health hazards of open defecation. Schoolteachers were roped in to teach people the importance of healthy habits like washing hands. Since 90 per cent of encephalitis cases are not treatable, prevention assumes priority. The initiative was successful for the first two years, but could not be carried forward due to lack of money. As implementation became less rigid, encephalitis made a comeback; its first casualty was Abhinav. Now, the Uttar Pradesh government has launched a plan to treat children suffering from EAS in primary health centres (phcs) and community health centres (CHCS). Amar Singh Rathore, director-general of medical health, Uttar Pradesh, has said it is a joint plan of the state government and National Rural Health Mission. path, an international ngo, will provide technical expertise. The plan, however, is not being cheered by those working on the ground. R N Singh says that phcs and CHCS do not have the necessary infrastructure to treat encephalitis cases. He demands the government should launch a National Encephalitis Eradication Programme. In its letter to the health secretary, Ministry of Health and Family Welfare, in October 2013, the National Commission for Protection of Child Rights mentioned that district hospitals of the areas prone to encephalitis are not equipped to treat patients. It is unlikely that phcs and CHCS will have suitable infrastructure to support the government’s plan. Hargovind Verma, chief medical officer of Kushinagar, says that out of 181 posts for medical officers in the district, hardly 80 are filled. There is no proper mechanism to keep track of the casualties in the state. Gorakhpur BRD Medical College alone gets at least 3,000 cases of encephalitis every year and sees 700 child deaths,according to K P Kushwaha, head of the paediatrics department. Singh believes the disease can be controlled by following preventive measures, like the village once did. “Emphasis should be on prevention along with its treatment,” he says.